Description: The small, greenish flowers are followed by small, round, orange to reddish brown berries. The leaves have prominent veins and a rough, scratchy texture and are green, alternate, non-symmetrical (curved and lopsided), and lance-shaped. 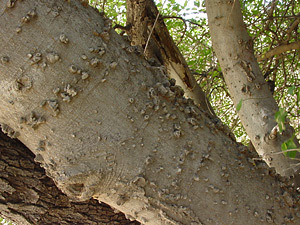 The bark is silvery gray, and with age, it becomes covered with strange, corky warts. Allergenic – The pollen is a moderate allergen. Butterfly Plant – Emperor butterfly caterpillars (Subfamily Apaturinae) feed on the leaves. 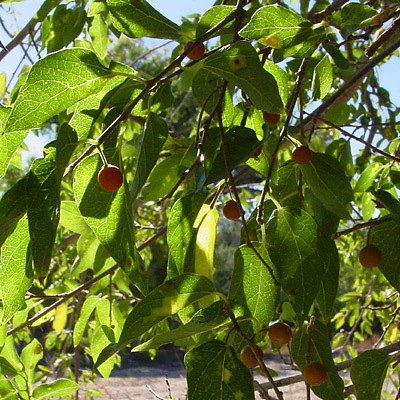 Culturally Significant Plant – Native Americans used the berries of C. laevigata for food, the bark for medicinal purposes, and the leaves to make wool dye. Edible – The berries are sweet and edible either raw or cooked, but they are small and rather dry.